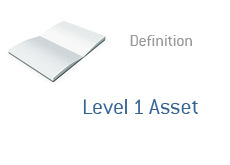 Level 1 Asset - What Does It Mean? What is a Level 1 asset? What is the definition of the term Level 1 asset? A short while ago we defined the term "Level 3 asset". A "level 3 asset" is an asset that is nearly impossible to determine a value for. For instance, how would you value a private equity stake? Or an ownership position in a commercial building? These are assets where market prices are not readily available, so companies will do their best to "guess" the value of these assets. These assets are not liquid. Level 1 assets, on the other hand, are the exact opposite. Prices are readily available for these assets, and they are also extremely liquid. Also, these assets trade in active markets. Example of a level 1 asset? A position in a publicly traded stock. US treasuries. ETFs. For instance - let's say that XYZ, Inc. is a bank, and XYZ, Inc. has a 10,000 share position in MSFT. This is a Level 1 asset - not only is a price readily available (MSFT is a publicly traded stock), but the asset is also very liquid. So - Level 1 assets are assets in which there is an active market and in which there are readily available quoted prices.